BROCKVILLE – Brockville General Hospital is getting $1.2 million as the facility goes through an expansion and renovation. Local MPP Steve Clark made the announcement to hospital staff this morning (Friday) on behalf of Health Minister Christine Elliott. The money – $1,267,151 – is from the Health Infrastructure Renewal Fund. 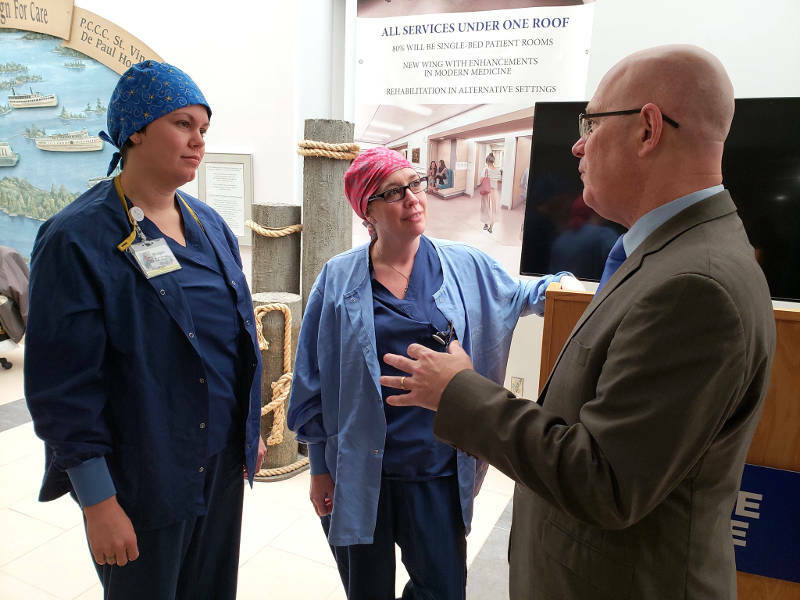 “It’s no secret that there’s some great things happening at the Brockville General Hospital,” Clark said. He called it a “cherished” and “invaluable” facility that has had some “difficult times” in the past few years. Hospital CEO Nicholas Vlacholias says the money will be used for a lot of internal items: modernizing the elevator system, ventilation and heating fixes and improvements to the bedside nursing call systems. “These upgrades will position us well for the amalgamation of our programs on the Charles Street site when we open our new patient tower as its going up now in the spring of 2020,” Vlacholias said. Construction started in March 2018 to build a five floor, 175,000 square foot addition in order to transfer services from the Garden Street site to Charles Street. The City of Brockville committed $4.7 million to the project and the Brockville and District Hospital Foundation has promised $10 million. All construction should be done by the fall of 2020.